National Cyber Security Awareness Month is an annual designation observed in October. Serious threats to personal data are at an all time high. Everyone, including individuals and businesses of all sizes, needs to remain diligent in their protecting themselves from hackers and privacy breaches. Scammers of all sorts bombard us through pop-ups, viruses, e-mails, phone calls and even the businesses we visit every day. Take steps to protect yourself. A growing stereotype amongst college students is a worsening addiction to social media. Scam artists have seized the opportunity to feed on unsuspecting students. One such technique involves scammers setting up fake pages for universities and reaching out to the college’s students to acquire e-mail addresses. Phony pages and profiles are created to harvest personal information. In its most innocuous incarnation, this sort of scam means an inbox full of spam. In its most hostile form, social media fraud can result in identity theft. To avoid these scams, add only friends you know, limit the information you post online, and be wary of invitations to “like” pages. Create secure passwords and don’t share them. Avoid common words, phrases, and personal information when creating passwords. Keep your anti-virus, software and operating system up to date. These updates keep your computer as current as possible with the latest viruses and patches to protect your computer. Never give personal information over the phone or in e-mail. Scammers love to call and claim to be someone they are not. Verify their authenticity by contacting the company directly. Don’t click on links in e-mails. Links are an excellent way to get a virus. The same goes for pop-ups. Turn-on the pop-up blocker on your anti-virus. If you still receive a pop-up, do not click on it. Never visit unfamiliar websites and beware of look-a-like links. These links will have a similar spelling or will end in .net versus .com will be an infected link attacking your computer. Laptop owners should install software to ensure the laptop can be tracked if stolen or remotely accessed to erase files or transfer files securely. When using social networks, use the privacy settings to protect your personal information. As with e-mail, clicking unknown links within social networks places your devices at risk. This includes strange friend requests, messages, and even innocent looking videos. Small business owners are especially vulnerable. Hackers increasingly target main street and with often limited resources, tighter budgets and a smaller workforce, these employers require a different approach to cyber security. Small Businesses can visit www.sba.gov for tips for tools and resources to help reduce cyber-incidents. There has been a lot of discussions recently about what makes for the most secure password. You might be surprised to hear that simple tends to be safer than complex. You’re more likely to forget a long, complicated password, and therefore more likely to write it down. Having to meet specific password requirements, or frequently change login information has the same problem. The solution? Choose something easy to remember that is unique to you, but not something obvious like a pet’s name or a favorite sports team. And you should never use the same password for multiple applications or websites. Change your passwords, get virus protection, watch your emails, pay attention to the sites you visit, etc. Use #CyberSecurityAwarenessMonth to post on social media. 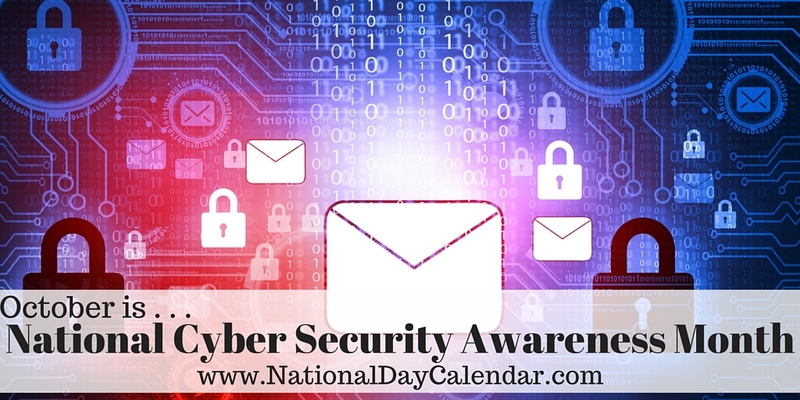 National Cyber Security Awareness Month was first observed by the U.S. Department of Homeland Security and the National Cyber Security Alliance in 2003. We are an independent agency providing for all your insurance needs in one place. Our personnel brings over 84 years of combined experience to help you improve your insurance situations and fulfill your needs. We are a member of the PROES Business Group. This association is a family of companies providing multiple avenues to make your life better. It brings business partners with the right background, experience and expertise to help you with your needs. Each agent, servicing representative and owner’s philosophy is to combine quality, price, experience and service in every facet of your insurance purchasing experience. We strive to build long term relationships by meeting the needs of our clients. The various backgrounds of our people help assure we can relate to your situation. Our goal is to help you have the right coverage, at the right price and be satisfied at the most important time – when you have a claim. We understand you are not buying insurance: you are buying piece of mind to protect yourself, your business and your family.